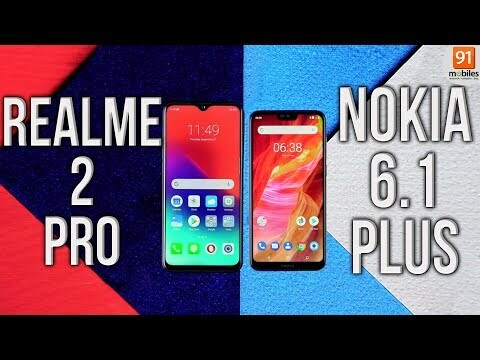 Realme 2 Pro 8GB variant is one of the powerful budget smartphone in India. The fastest processor when paired with 8GB of RAM, delivers impressive performance. You can do all the heavy tasks like playing PubG with ease. The device not only packs power but also looks attractive thanks to the glass looking back. The camera quality on this thing is pretty impressive with shots coming out to be amazing. 1 Pricebaba user have written their experience with Realme 2 Pro 128GB. If you own Realme 2 Pro 128GB, please do leave your feedback too. Lowest price of Realme 2 Pro 128GB price in India starts at Rs. 15,990 Realme 2 Pro 128GB is available on Flipkart at Rs. 15,990. Prices updated on 21st April 2019. Design-wise, the Realme 2 Pro flaunts a trendy waterdrop notch as seen on the Vivo V11 Pro and Oppo F9 Pro. The back panel of the device ditches the signature diamond-cut back pattern in favour of glass design. The smartphone is available in three color variants i.e. Ice lake, Blue Ocean, Black Sea. On the display front, the device features a massive 6.2-inch FHD+ IPS LCD display with narrow bezels. The display is shielded by a Corning Gorilla Glass on the top. In the imaging department, the Realme 2 Pro features a 16MP+2MP dual rear camera setup. It uses a Sony IMX398 sensor with f/1.7 aperture that aids in better photos in low light. A 16MP shooter is fitted on the front for selfies and video calling purposes. The camera is equipped with AI-powered features like intelligent-scene detection, portrait mode and more. For additional security the front camera also doubles up as a face unlock feature. Under the hood, the Realme 2 Pro houses a Qualcomm Snapdragon 660 chipset. The device packs 8GB RAM and offers 128GB internal memory. The storage can be expanded with the dedicated microSD card slot provided. There is a Adreno 512 GPU onboard. The Realme 2 Pro runs on Android 8.1 Oreo OS with Oppo’s proprietary ColorOS skinned on the top. The Realme 2 Pro runs on a 3,500 mAh battery unit. As for connectivity, the device offers Dual 4G VoLTE, WiFi 802.11, Bluetooth 5.0, GPS, and GLONASS. The phone also comes with 3.5mm headphone jack for plugging audio accessories.